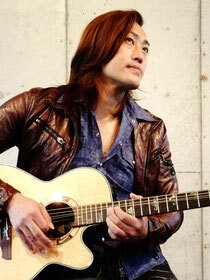 Guitarist and Composer mainly working in Western Japan. Discovered his sense of sound while learning to play the piano as a child and then went on to teach himself to play the guitar. Started his career as a composer and guitar soloist when he was deeply influenced by the background music on games and movies. Rock and Healing tunes are just a few of his vast field of expertise. His aggressive performance technique has been appraised by many which has lead to successful career performing in live houses, cafe's, concert halls and even the Noh Theater; a traditional Japanese theatrical form. In 2008 he was awarded the Most Excellent Player award at POWER LIVE CONTEST held at the BIG CAT. 2009 was recognized not only as a guitarist but as a composer for his original song "Playground". Was awarded a monitor contract with guitar maker TAKAMINE the same year. 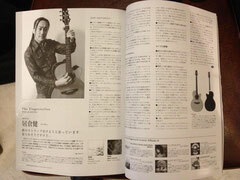 In 2011 was named one of 5 guitarists to watch for by Oshio Kotaro in "Acoustic Guitar Magazine". Currently is focused on composing music in his career and supporting artists with recording and arranging. Copyright (C) 2013 copyrights Studio Green Room All Rights Reserved.